When I need a break from the daily grind, a weekend overnight or two at a luxury hotel does wonders. Sometimes it’s just too challenging not to work while at home — my “to do” list is always calling and by Sunday night I feel like I’ve had no downtime. As a consequence, I always have a list of favorite getaways ready for relaxation emergencies. In the San Francisco Bay Area, this list includes Cavallo Point Lodge in Sausalito, The Ritz-Carlton Half Moon Bay, and The Carneros Inn in Napa Valley. Although these hotels offer vastly different guest experiences, all are luxury getaways within an hour or so of many Bay Area neighborhoods (and the SF International Airport). When I heard Rosewood Hotels & Resorts opened a new property on Sand Hill Road in Palo Alto, I had a strong hunch my getaway go-to list was about to grow as the Rosewood brand is synonymous with truly exceptional luxury hotel experiences. We selected San Ysidro Ranch in Santa Barbara for our 10th anniversary celebration — let’s just say I’m not surprised to see this property achieve the number 4 spot on the Travel & Leisure’s World’s Top 25 Hotels for 2011. We were wowed at every turn during our stay there. Another Rosewood data point for me is the fact that the Rosewood Mayakoba is a much-loved asset to our Mexico portfolio. Yes, the suite-style rooms are ideal for families, but the stand-out feature is the gracious staff and phenomenal service standard. I interviewed Yolanda Edwards, the ex-Travel Editor of much-missed Cookie Magazine, for this review. Yolanda has stayed at many amazing hotels — a service shout out from her is a huge honor. (Be sure and check out Travels with Clara to follow Yolanda’s latest adventures). Interestingly, I first approached the Rosewood Sand Hill to review the property as a venue for a moms/girls getaway. We are lucky to have even a one-night hall pass from our husbands and kids, so a convenient location is everything. I arrived with my sister-in-tow on a gorgeous Sunday afternoon and was surprised to find a healthy dose of families by the pool. I wonder if the hotel anticipated this family popularity given that during the week the hotel is clearly full of business travelers taking advantage of the prime Silicon Valley address. After staying at the Rosewood Sand Hill, the family attraction makes perfect sense for a number of reasons. First, the pool area is lovely with plenty of room for guests to carve out their form of relaxation albeit reading, swimming, or indulging in the excellent poolside menu. It works for all ages and interests because the vibe isn’t trendy or flashy, but quintessentially Northern Californian with understated luxury in a “be who you are” atmosphere. Second, the weather at this location is excellent for pool days from early spring through the fall. The Bay Area has micro-climates where 10 miles in one direction may mean a dramatic climate shift. In this case, Palo Alto is often warm and sunny while other parts of the bay are shrouded in fog. An important note is that Rosewood Sand Hill is compact. There is very little for kids to do onsite other than hit the pool. That said, the location is just minutes from miles of hiking and biking trails through some of the Bay Area’s most picturesque open-space preserves. Stanford Shopping Center is one of the best outdoor malls I’ve encountered anywhere and Palo Alto is a joy for strolling and dining. For adults, however, the spa and fitness center is a much-coveted amenity. I gave both a test drive and they do not disappoint. The fitness has all the state-of-the-art machines you’d want and expect for a weekend getaway. They also offer yoga, spinning, meditation, and other group classes. The spa is very relaxing and an extension of the understated elegance that characterizes the rest of the hotel. An extensive treatment menu includes enough to rework you thoroughly from head to toe. Although the spa is not as decadent in design as other spas in the luxury quality category, my massage treatment was top notch. If the pool is one highlight, a meal at the onsite one-starred Michelin restaurant, Madera is another. The large open-plan dining room is gorgeous with an exquisite menu featuring artisan delicacies from around the country. Although they have a kids’ menu, dinner here should be a leisurely affair where you have time to appreciate the full dining experience. If you have young and restless children, an alternative option is to eat lighter fare off the bar menu (you can still access the kids’ menu here). The main dining terrace extends through the bar and lounge area, so you can eat outside and enjoy the stunning coastal mountain view. Room configurations for families include connecting rooms and suites. The pool area is completely fenced so parents need not worry about lower floor rooms facing the pool area. Second floor rooms have better mountain views, but otherwise, the quality across room categories is consistent given that the property is brand-new. Rosewood’s kids’ program is called Rose Buds and provides essentials for babies and a few kid-size treats. Intentional or not, families like this hotel. I’d like to see the hotel management put out a ping pong table or croquet set during the weekend to enhance the leisure tone. 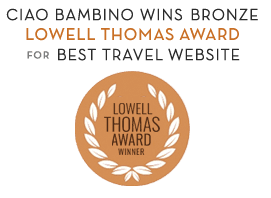 If you are familiar with Ciao Bambino’s hotel review methodology, you know that Families Should Know is an essential part of the way we cover accommodations. No property is perfect. In the case of the Rosewood Sand Hill, the main downside is the proximity to the 280 motorway. Although this must be one of the most gorgeous highways in the world, it is still a place that has a steady stream of speeding cars. When you first see the view from the hotel, your first reaction is disbelief that this luxury hotel is positioned so close to the highway. Once you settle in, however, you forget about it entirely. The pool is positioned below the freeway so you don’t see or hear it from there, plus they’ve done a good job with the landscaping and music to ensure this is the case. We never heard noise from our room, although when the property is quiet and balcony doors are open, this must be a possibility. In conclusion, the freeway is not a deal breaker. Expect it to be there and then forget about it and you’ll fully enjoy this getaway — with or without kids! Photos courtesy of Amie O’Shaughnessy and Rosewood Sand Hill. Rosewood Sand Hill provided complimentary accommodations. They did not ask us to express any particular point of view.